* Checks for Carbon Dioxide (CO2) concentrations with Max/Min value recall function. * Maintenance free NDIR (non-dispersive infrared) CO2 sensor. * Indoor Air Quality displayed in ppm with Good (380 to 420ppm), Normal (<1000ppm), Poor (>1000ppm) indication. * Visible and Audible CO2 warning alarm with relay output for ventilation control. * Displays Year, Month, Date, and Time. * Automatic Baseline Calibration (minimum CO2 level over 7.5 days) or manual calibration in fresh air. * A Quality product from Extech, USA. Measures Carbon Dioxide (CO2), Air Temperature and Humidity * Checks for Carbon Dioxide (CO2) concentrations with Max/Min value recall function. * Maintenance free NDIR (non-dispersive infrared) CO2 sensor. * Indoor Air Quality displayed in ppm with Good (380 to 420ppm), Normal (<1000ppm), Poor (>1000ppm) indication. * Visible and Audible CO2 warning alarm with relay output for ventilation control. 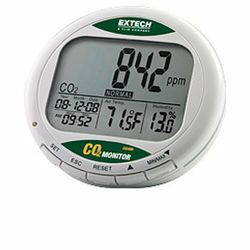 * Measurement ranges: CO2 : 0 to 9,999ppm Temperature: 14 to 140°F (-10 to 60°C) Humidity : 0.1 to 99.9%RH* Displays Year, Month, Date, and Time. * Automatic Baseline Calibration (minimum CO2 level over 7.5 days) or manual calibration in fresh air. * A Quality product from Extech, USA.